One actress has told that the viewers who watch and clap in our film are fools … “Dear actress, because you say the viewers are fools, your movies had never got viewers…” Get well soon! In response to the the statement by the film makers and the actresses of ‘Chhakka Panja 2’ (Note: Swostima wasn’t in the first movie that Richa referred in the talk. ), Richa has challenged them to prove that she is sick. The Kathmandu District Court has ordered the organizer of Nepal Idol reality show to stop counting the vote by the viewers and present at the court on Bhadra 23 (September 10, 2017). According to reports, the court has ordered to submit the originals of the voting to AP1 TV. The court was responding to the application of Yagyamani Neupane against the organizer of making one-sided decisions on the organization of the show. According to the decision by the district judge, Diwakar Bhatta, the future of the program will be decided after the decision made on September 10. A singing competition reality show franchise titled ‘idol’ had been quite popular in different countries. After a huge success in India titled ‘Indian Idol’ a similar contest is being held in Nepal. The show is being organized by a new Television station by the Annapurna newspaper group, AP1 TV. One more film award, are you interested, excited? INAS Award nominations were announced on November 5, 2016. Right after the announcement, the organization’s Nepal Chapter members were not happy. That is not all, I think, nobody is interested or excited about yet another award. Although many accuse omission of some of the best movies, the the nominations are expected. The winners will most probably be the same one that had already won different awards for the same movie, same artists and category. I am sure, many winners won’t go to receive the award. 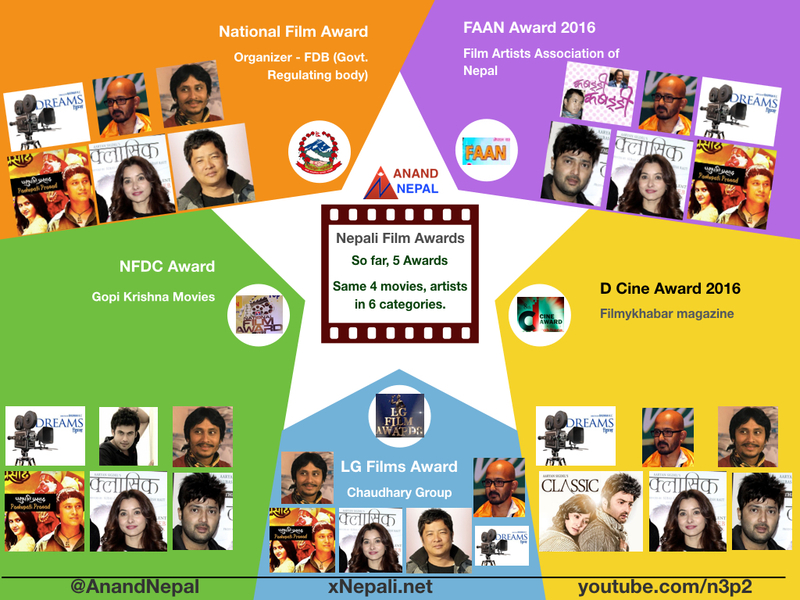 Some of the members of INAS (International Nepalese Artists Society) have expressed their dissatisfaction over the nomination on the award. When two successful movies ‘Woda Number 6’ and ‘Prem Geet’ were not nominated in any categories, some of the members accused that the jury had made decision without even watching the movie. What had happened – Sushmita KC expressed her dissatisfaction about the report about her movie ‘Ma Ta Timrai Hun’ aired in the 35th episode of a Kantipur TV film program ‘Rajatpat’. In the report aired in the TV show, her debut production movie was a failure and it didn’t do good business. Click here for more details of the controversy. Social network is a crowd of people. If you expect something from them, you are bound to be disappointed. The latest proof of that fact is the recent open letter of Nepali actress Priyanka Karki. Priyanka Karki has expressed her dissatisfaction on the comments she received in her social media pages. Did Priyanka Karki write the letter to create controversy? Priyanka is one of the most social-network active actress in Nepali film industry. No other actress in Nepali film industry has explored the social media as Priyanka Karki. She had organized social meet-up in Facebook, Twitter and Instagram. She has extensively discussed with her followers in the past. She knows, people can get away with telling anything in social media because of it’s anonymous. UPDATE: After the protest of various Sherpa organizations, Suvekshya Thapa has apologized for the mistake and has told that she had no intention of hurting Buddhist people. In the mean time, various organizations had asked Thapa to be punished for undermining their faith and beliefs by using holy Khada to cover her body parts. Actress Suvekshya Thapa is known to create controversy for the promotion of her movies. Like her previous movies, Suvekshya has chosen to show off her body to promote her upcoming movie ‘Bindaas 3’. In the photos published in onlinekhabar, Suvekshya has covered her body under religious shawl-like cloth – ‘Khada’. ‘Khada’ is used to honor and appreciate people and it is also offered to the god in Buddhist culture. In the photos, Suvekshya has wrapped a blue khada to look like skirt and a white one to cover the upper body parts. She is well covered and this looks a lot better than the photos she did for the promotion of her previous movie ‘Miss Nepal’. The promotional photo of her earlier movie was copied from Bollywood actress pose in which she had used a fish to cover the upper part of her body. The prime minister of Nepal, KP Sharma Oli, rejected the proposal to construct a Film City in Dolkha. In an event held at his government residence in Baluwatar, Oli has told that the location proposed by the previous government wasn’t appropriate. He has told that the location in Dolkha is such that it doesn’t see sunshine for more that two hours – that too only for two days in a week. The location was proposed by the Film Development Board (FDB) during the leadership of Dharmendra Kumar Marbaita. Dharmendra and the team had visited the location various times to come to the conclusion. After the current prime minster, KP Oli rejected the previous decision, there had been reports of protest in Dolkha. Oli was talking in the promotional event of upcoming movie by Dinesh DC, ‘Fulai Fulko Mausam Timilai’ held on December 28, 2015. The first film promotional program held in the PM’s government residence in the history of Nepal was also criticized the political pundits. KP had told that Dolkha’s climate and geography don’t suit for the construction of Film City. Actor Bhuwan KC and controversy goes hand-in-hand. It has been quite a while there weren’t any controversial news about him, except of course, his debut as a director. In a latest report, Bhuwan KC‘s movie ‘Dreams’ has bee dragged into controversy over a hotel bill. The movie team has recently completed the shooting of the movie in Pokhara. At the time of checkout Bhuwan reportedly couldn’t pay the Rs. 500,000 bill at the hotel. According to a local reporter Deenanath Baral, the hotel owner had snatched Bhuwan’s car on the failure of the payment. Bhuwan KC and the team was staying in Hotel Peaceful in Damside, Pokhara. At the time of welcoming the new year 2070 BS, let’s talk about the most talked about actresses in the year 2069. Actress Rekha Thapa has become the most talked about in actress xNepali in 2069. So the title of ‘Controversy Queen of 2069 goes to Rekha Thapa! After Rekha, the runner-up of the Controversy Queen 2069 is Sumina Ghimire. She jumped into the next-to-the-top position in the last days of the year when she let her anger rule in a telephone conversation with a journalist. None other than Sushma Karki took the second runner-up title with numerous controversies involving directors and boy friends. The year started with the divorce rumor and confirmation by both Rekha and Chhabi Raj although no legal confirmation was publicized. When Chhabi registered Chhabi Raj Films, the divorce was considered confirmed. After being single, Rekha discussed the possibility of her career in politics with an astrologer. Her attempt to get herself appointed as the head of Film Development Board might have been according to the suggestion of the astrologer. But, when the political lobbying didn’t work, she went to USA in a month-long tour. In an article published in Korea Times, the Indian Ambassador to South Korea, Vishnu Prakash, argued that one of the reasons the North-Eastern part of the country is beautiful because of the existence of Mt. Everest. The northeastern part of the country where it borders China offers the most beautiful scenic views thanks to Mt. Everest. owever is in the border of Nepal and China, at least 200 km away from the Indian border. Nepali print and online media have started protest to the statement. You can read the full article in this link.